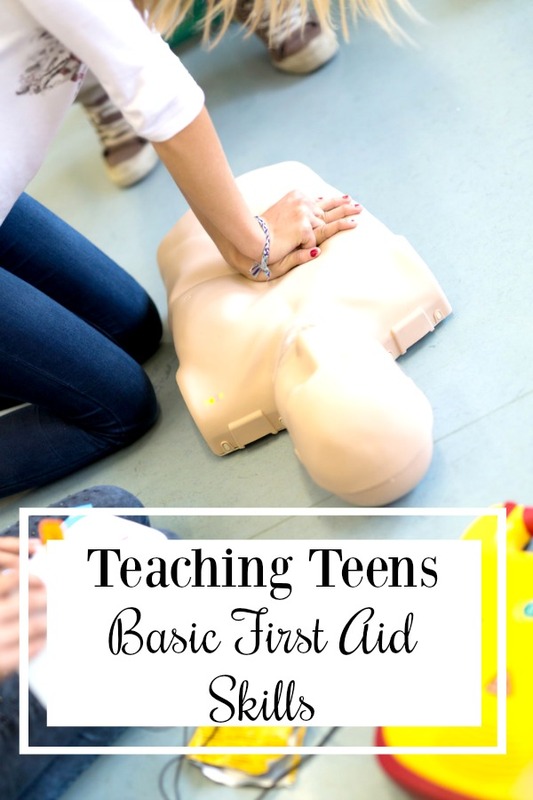 This month in the year of teaching teens life skills is all about first aid! The beginning of summer is a great time to go over basic first aid skills whether it’s for the first time or a reminder. Below you’ll find four weeks of topics and resources for teaching teens basic first aid skills. Talk about what to have in a first aid kit at home. Show your teen the one in your home or build one together if you don’t already have one. Discuss how to treat different ailments like burns, bug bites, sunburns, and cuts. Check YouTube for video tutorials to see treatments. If a CPR class is offered to teens in your area consider signing up for it. My daughter took one a few years ago with Girl Scouts but we could both use a refresher. Discuss the important numbers to have on hand: doctor’s office, local emergency room, and poison control. Set-up an ICE contact in their phone if there isn’t one already. TeacherPlanet.com has lots of great guides and printables for teaching first aid skills to teens and kids. Check them out to help you through these next few weeks. Stay tuned for July and Teach Teens Self-Care and Healthcare! If you are just joining us, you can find the previous month’s topics below.